Made from PLA (Poly lactose acid) cornstarch, a sustainable crop. 100% Compostable and Biodegradable printed on cups. Can be used with lids 942002 or 942004. For cold drinks; melts above 40 C.
Suitable for industrial composting (too slow for home composting). Conforms to EN 13432. Made from PLA (Poly lactose acid) cornstarch, a sustainable crop. For cold drinks; melts above 40 C.
Suitable for industrial composting (too slow for home composting). Conforms to EN 13432. PLA plain WATER cups; no lids available. Made from PLA (Poly lactose acid) cornstarch, a sustainable crop. 100% Compostable and Biodegradable printed on cups. .
Can be used with lids 942001 or 942003. For cold drinks; melts above 40 C. Suitable for industrial composting (too slow for home composting). Conforms to EN 13432. Made from PLA (Poly lactose acid) cornstarch, a sustainable crop. 100% Compostable and Biodegradable printed on cups. Flat lids for clear PLA cups. Made from corn starch. 100% biodegradable and compostable (industrial composter). Centre hole for straw. Conforms to EN 13432. Made from PLA (Poly lactose acid) cornstarch, a sustainable crop. For cold drinks, melt above 40 C.
Straws made from corn starch. 100% biodegradable and compostable (industrial composter). Conforms to EN 13432. Patented paper straws which don't dissolve in your drink but biodegrade quickly in waste. Food Safe. 25 straws are packed in a clear compostable PLA bag. Available in green, red and yellow. 2oz PLA round containers, certified compostable. PLA round containers, certified compostable. Delivery time 3 days for all the below. Made from compostable PLA, round pot with separate lids. Delivery time 3 - 4 days. Made from renewable compostable PLA, 3 days on order unless shown otherwise. Cutlery made from renewable and compostable starch. Certified by OK compost. Not suitable for your garden compost, needs to be in an industrial composter. Put in your brown bin. Certified EN13432. Made from RCPLA = recycled PLA = from off-cuts/waste from making clear cups & lids. Tea spoons are 4.5" long, other cutlery is 6.5" long. Cutlery made from plastic with an added oxidising agent. They degrade, then biodegrade on land, at sea, in sunshine or dark, in heat or cold and will convert into water, CO2 and biomass. Leaves behind no fragments, no harmful residues and does not emit methane. NOT certified EN13432 to go into your brown bin but will break down quickly in normal waste or landfill. FSC certified wooden spatulas and spoons. Spoons come in large and medium sizes. FSC certified wood, 100% biodegradable, 100% compostable. Comes in three sizes. 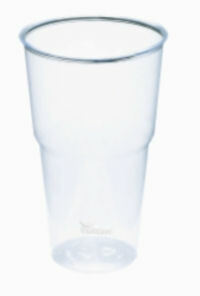 High quality, machine washable ceramic cups with white sip through silicon lids - made by Koenitz in Germany. 380ml volume, 11 cm height, heat reducing grip around the top. Trays made from the waste of sugar cane plants. 100% biodegradable, 100% compostable (suitable for your garden compost heap). No plastic lining. Cones for chips, chestnuts or pretzels made from sustainably sourced compostable paper. Newsprint design for a retro feel. Food-safe! Compostable brown cardboard board food boxes in various sizes better explained here. Made from sustainably sourced paper board with water-based, compostable grease-resistant lining and leak-proof webbed corners. Corrugated sleeves for single wall hot cups. 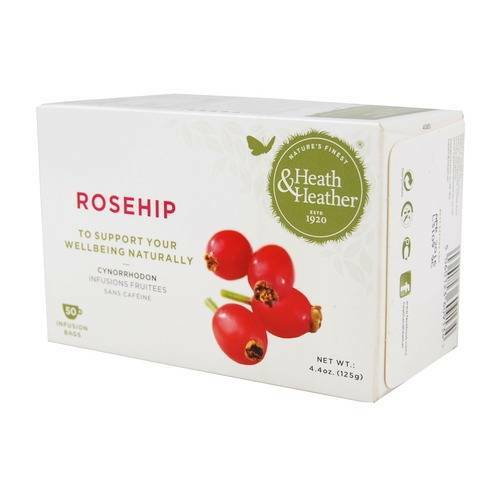 Made from 100% recycled paper, suitable for 8-10oz cups (250ml-300ml) and 12-16oz cups. RELAX cups show the tree design. MADE IN IRELAND cups have no design but they show the guaranteed Irish logo and the wording "completely compostable". Available in OYSTER or BROWN KRAFT. Certified compostable in IRL. Plastic-free, sealable hot/cold food box. Bagasse base made from sugar cane fibres. Base size:13 x 19 cm Comes with a choice of three lids. 1) clear sealable presentation lid which is freezer and microwave safe. 2) clear PLA lid or 3) bagasse lid which is freezer and microwave safe. 100% compostable. Delivery time 7-8 working days. Plastic-free, sealable hot/cold food box. Bagasse base made from sugar cane fibres. Base size: 18 x 19.5 cm. Comes with a choice of three lids. Plastic-free, sealable hot/cold food box. Bagasse base made from sugar cane fibres. Base size: 18 x 25 cm. Comes with a choice of three lids. 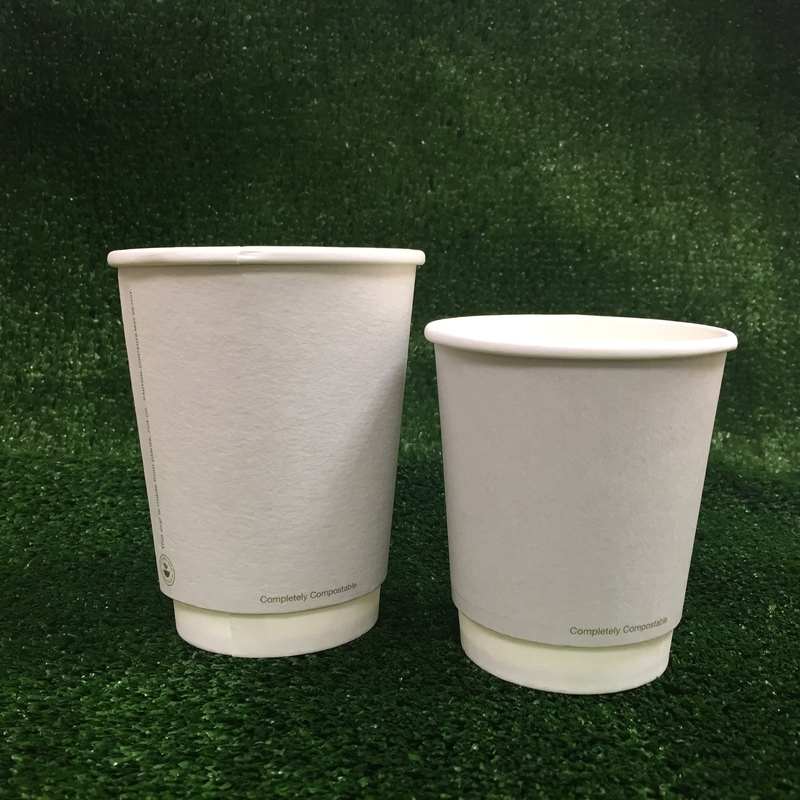 Single wall paper cups lined with PLA & 100% compostable. White & brown cups have small amount of text, not plain. RELAX brand has tree design, see images. Not suitable for home composters - takes too long to disintegrate. Perfect for industrial composters (brown bins). Conforms to EN 13432. For compostable paper cups. Lids are made from PLA vegetable based plastic. Suitable for industrial composters. Round single wall paper bowls lined with cornstarch bio plastic to hold liquids / wet food. 100% compostable. Suitable for hot food. Lids fit tightly and are translucent white - NOT CLEAR. Made from translucent white PLA vegetable based plastic. Suitable for industrial composters. EN 13432. Tight perfect seal for our 12oz and 16 oz soup bowls. 115mm diameter. Single wall paper, lined with PLA (cornstarch), 100% compostable, made from renewable plants. Perfect for industrial composters (brown bins). Conform to EN13432. Extra strong, 100% recycled aluminium. 29cm x 10m. Brown unbleached totally chlorine free parchment baking paper, FSC certified, certified compostable EN 13432. 100% compostable for the garden compost. 33cm wide and 19.8m long. 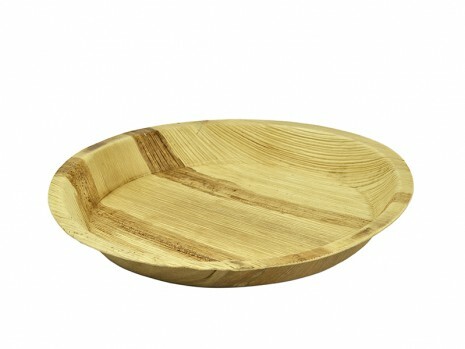 Natural palm leaf tableware is made of Areca nut palm leaves gathered in the forests of Kerala, Southern India. No coatings, no additives and no chemicals! Fallen leaves are collected, soaked in spring water, heat pressed into shape, then dried. Made from the waste of sugar cane plants. 100% biodegradable, 100% compostable (suitable for your garden compost heap). No plastic lining. Waterproof for up to 4 days. 15x15cm. Microwave and freezer proof, suitable for very hot liquids up to 95Celsius (203F). Biodegrade within 30-90 days. Conforms to EN 13432. Made from the waste of sugar cane plants. 100% biodegradable, 100% compostable (suitable for your garden compost heap). No plastic lining. Waterproof for up to 4 days. Containers made from sugar cane bagasse which is certified home compostable. Bowls are suitable for microwaving and withstand temperatures from-10°C to +120°C. Perfectly stackable. Comes with a recyclable recycled PET lid which is suitable for temperatures -40°C and +54°C. Tight fitting, leak proof! 4 DAY delivery. Base made from compostable sugar cane has a natural brown speckled colour and is very rigid. Lid made from recyclable polypropylene (PP symbol 5). Tight fit, leak proof. Use in microwave and freezer. This bowl is very strong and will hold liquids for 4 days. Full boxes of 1000 have a 4 DAY delivery. Made from the waste of sugar cane plants. 100% biodegradable, 100% compostable (suitable for your garden compost heap). No plastic lining. Waterproof for up to 4 days. Microwave and freezer proof, suitable for very hot liquids up to 95Celsius (203F). Biodegrade within 30- 90 days. Conforms to EN 13432. Sugar Cane Plates - 23cm/9"
Microwave and freezer proof, suitable for very hot liquids up to 95 Celsius (203F). Biodegrade within 30-90 days. Conforms to EN13432. Sugar Cane Side Plates - 15cm/6"
Sugar Cane Small Plates - 18cm/7"
Looks like a can. Mug colours: natural silver, black or white. 70mm diameter, 145mm height. The black lid has a flip top which seals perfectly when not in use. 300ml capacity. Printing area 205 x 70m. Delivery time 2-3 weeks. 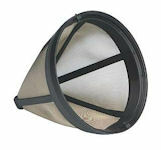 Re-usable coffee filter made from micro steel mesh with PP frame. Dishwasher safe. Size 4. No need for filter papers. Fits into all common filter machines. Unbleached brown coffee filters, size 4. 100% fully certified Fairtrade sourced coffee. Perfect balance between acidity and mildness. Flavours of berry fruits, caramel and Amaretto. Roasted and packed in Brescia. Zero Impact® packaging. Grown by certified Fairtrade farmers using only natural methods of cultivation and no artificial fertilizers or pesticides. Great value - great taste. Certified organic coffee grown in Mexico and Peru, bought from small farming communities for fair prices. Produced by memo. Slow roasted, low acidity, full mild aroma. Great price! Simon Levelt Medium Roast Coffee made from 100% organic Arabica beans, a full bodied and fragrant organic blend. Decaffeinated with respect for our environment. Directly sourced and fairly traded. Suitable for filters and cafetieres. Simon Levelt Dolce coffee made from 100 % organic Arabica beans, a fragrant blend of the finest selection Arabica beans. Dolce is a full bodied yet mild blended coffee with a rich aroma. Directly sourced and fairly traded with Fair Trade certification shown on the pack. Suitable for filters and cafetieres. Simon Levelt is passionate about coffee: direct sourcing and fair trade with a focus on organic quality. FORTE is a superior blend of the finest Arabica beans with some Robusta beans to strenghten. A strong and full bodied coffee purchased directly from the plantations in Latin-America and Africa. Suitable for filters and cafetieres. Kraft fully lined bloomer bag with window. 15x7.5x22.5 cm. Lined with compostable clear plant based bio plastic. Food grade. Part recycled brown strong Kraft paper, no handles, made in Ireland. 7x13" with 4" gusset = 18x33cm with 10cm gusset. Food safe. Ideal for sending bulky goods. Combine with our 400g or 650g compostable clear food grade bags to pack your goodies. Block bottom enables envelopes to stand upright. 100x245mm with 4cm gusset. Made from 120g brown recycled strong paper, can be closed neatly with a brass fastener or with brown paper tape. Ideal for sending bulky goods. Combine with our 1kg compostable clear food grade bags to pack your goodies. Block bottom enables envelopes to stand upright. 120x285mm with 5cm gusset. Part recycled brown heavy weight uncoated paper (used by Cafes) or 39g light weight paper (typical counter top basic flimsy bags), made in Ireland. Thin 39g bags are not suitable for greasy food. Made from compostable cornstarch, 26x26cm, 30 micron, one side is white, the other side is clear. Suitable for cold square sandwiches and rolls, small round cakes and breads. 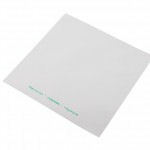 Unbleached BROWN 50gsm sheets from chlorine free FSC certified paper - oven & microwave safe up to 220C. Classic WHITE 30g chlorine free paper sheets from a sustainable European source. TRANSLUCENT sustainably-sourced paper with a plant-based greaseproof coating. Made from Natureflex (tree fibres) which is 100% compostable and certified food grade, 30 micron, heat sealable. Natureflex is a bit softer than PLA and better suitable for packing bulky (not flat) goods. Made from FSC certified cellulose from trees. Certified for industrial & home composting, approved for marine biodegration. Excellent transparency, moisture barrier, heat sealable. It is a rigid film - not clingfilm. On a roll, 50cm x 25m. Made from FSC certified cellulose from trees. Certified for HOME composting, approved for marine biodegration. Transparent, moisture barrier, heat sealable. Holds ~1.3kg rice. 30x12cm +6cm gusset. Material is food certified. Store away from heat and sunlight. Starts shrinking after 6 months. More information. Made from FSC certified cellulose from trees. Certified for HOME composting, approved for marine biodegration. Transparent, moisture barrier, heat sealable. Holds ~ 1kg rice. 30x9cm + 6cm gusset. Material is food certified. Store away from heat and sunlight. Starts shrinking after 6 month. More information. Made from FSC certified cellulose from trees. Certified for HOME composting, approved for marine biodegration. Transparent, moisture barrier, heat sealable. Holds ~ 300g rice. 18x7cm + 3cm gusset. Made from FSC certified cellulose from trees. Certified for HOME composting, approved for marine biodegration. Transparent, moisture barrier, heat sealable. Holds ~ 400g rice. 20x7.6cm +5cm gusset. Made from FSC certified cellulose from trees. Certified for HOME composting, approved for marine biodegration. Transparent, moisture barrier, heat sealable. Holds ~ 650g rice. 25x7.6cm +5cm gusset. Made from FSC certified unbleached total chlorine free paper, certified compostable EN13432, natural barrier (no petroleum). 7.5x6.5x2.25" = 190x162x57mm, 48 sandwich bags per box. At the moment made from virgin paper. Made in Ireland, 100% biodegradable, 100% compostable. 7x9" = 176x225mm, 50 sandwich bags per box. 100% recycled brown, one ply serviettes, 30 x 30 cm. 100% recycled printed in green on each serviette. Made in Europe. Packs of 250 come in paper sleeves - NO PLASTIC! 100% recycled brown, two ply serviettes, unbleached, 24 x 24cm, made in Europe. 33cm x 33cm, 2-ply, 100% recycled, bleached using an eco friendly chlorine-free process, soft white, made in Europe. Unrefined Organic certified Fairtrade raw cane sugar. Produce of the Association Agricola Canera del Sur Co-operative in Paraguay. Fairtrade brown Demerara sugar sachets for use in meetings, conferences etc. Fairtrade products are sourced from farmers who are rewarded with a fair purchase price for their wares. Fairtrade white sugar sachets for use in meetings, conferences etc. Fairtrade products are sourced from farmers who are rewarded with a fair purchase price for their wares. Giving you an easier way to dispense sugar, this Fairtrade sugar canister is ideal for use in catering and hospitality. Easy to pour the correct amount. Fairtrade is dedicated to making sure that people from developing countries get paid a fair amount for their produce. This white vending sugar features a specially enhanced formulation that flows more freely compared to regular granulated sugar. Ethically produced with Fairtrade-certified pure cane sugar for a fairer deal for sugar producers. 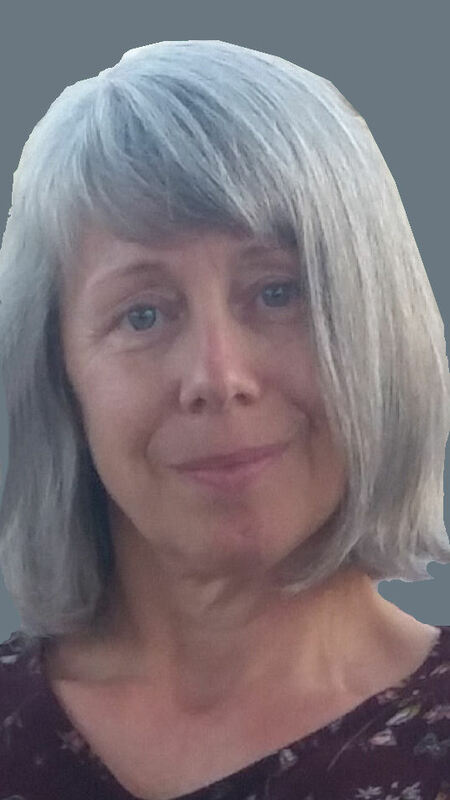 Intelligent Tea - tasty and therapeutic from native herbs & plants. MORNING GLORY: Irish grown lemon balm & marigold. ELEVATE: Irish grown lemon balm, nettle, rosemary, marigold and chamomille. Organically grown blends from single estates. 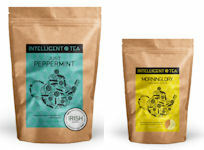 Intelligent Tea is an Irish Start Up worth while to support. Clipper Organic Tea is delicious and natural with a full rich flavour and bright fresh colour. Sourced from Africa, India and Sri Lanka under fair trade conditions but not independently certified. Clipper tea bags are made from unbleached paper. Only the Green Tea carries the Fair Trade label. Clipper products are made with pure ingredients and a clear conscience using only the highest quality sources, add nothing artifical and strive to improve the welfare of workers. Certified organic. More herbal teas to follow on demand. Bewley's Finest traditional catering tea, expertly blended in Dublin since 1840. Made from quality tea leaves from Rwanda, Kenya and Assam, and expertly blended for a strong, satisfying flavour. Good news for our zero waste customers: Bewley's tea bags come loose in a cardboard box without any plastic! Barry's Green Label Tea Bags blended in Cork since 1901, catering size. 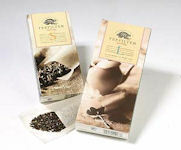 Single use unbleached biodegradable filter bags for loose tea. Size S for 1 - 4 cups of tea. One side is longer to hang over the edge, it makes it also easier to fill. Each bag has a double folded floor. 100 filters per box. 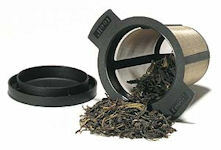 Re-usable filter for loose tea made from micro steel mesh with PP frame. Dishwasher safe. Suitable for mugs and tea pots. Comes with a lid which can be used to catch extra liquid when the filter is removed. Each box contains a selection of 4 delicious biscuits: Viennese Whirls, Butterscotch Crunch, Chocolate Chip Brownies and Oat Crumbles. Individually wrapped in twin packs. Each pack contains 3 mini biscuits in 6 varieties: ginger nuts, digestives, custard creams, bourbons, fruit shortcakes, rich shorties. Individually wrapped.